Narrow leaves and lovely 1/2in -1 in. trumpet-shaped flowers adorn this attractive native Chinese vine. 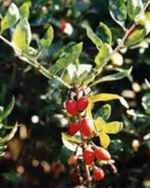 Fruits, which appear in late summer or early fall are deep red and have many tiny seeds. Dried, they resemble cranberries. The leaves of the vine are often eaten as cooked salad greens and the berries are a popular snack in Canton. In China, the herb is used to strengthen muscles and bone, as a liver tonic and to improve vision. The plants grow rather like grapes (but they have no tendrils for clinging and must be tied) are hardy to -30F (-34.4C) after the first year. They perform best if grown on a fence or trellis for support in well-drained soil in full sun and grow to an average height of 10ft. Not available to AK,HI,CA,NV,UT,AZ,WA or outside U.S.